I graduated from my first course Falmouth School of Art nearly thirty years ago. It was a unique course which evolved during its four-year duration. The course introduced us to a wide variety of media for conveying information including video & animation. Consequently, quite a few of the GID’s, as we are collectively known, pursued a career either in CGI or character animation. A few, including my nearest and dearest, went on to perfect their skills at Bournemouth and subsequently rubbed shoulders with the Aardman team. So when I heard Ben Toogood was to give a lecture on Visual FX, I couldn’t miss the opportunity to slip into the magnificently lit Chapel lecture theatre to listen. Now Head of 3D for the Aardman Animations CGI department, his current work is varied. Which he elaborated upon in his lecture. Budget, safety, quality and just achieving the impossible are at the root of much of Aardman’s current FX work. The CGI department’s specialism is lighting/rendering processes and technologies for TV dramas, commercials and films. A bulk of their work also involves creating environments, crowds and even digital doubles. 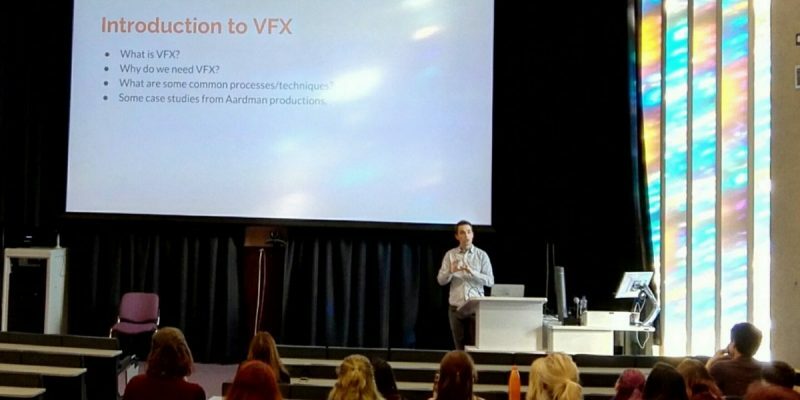 Ben’s informative and well-structured lecture delivered some constructive advice on how FX is used throughout the industry. It also introduced the current batch of animation students to the possibilities of work outside the realm of character driven animation. Food for thought for any inspiring animators.